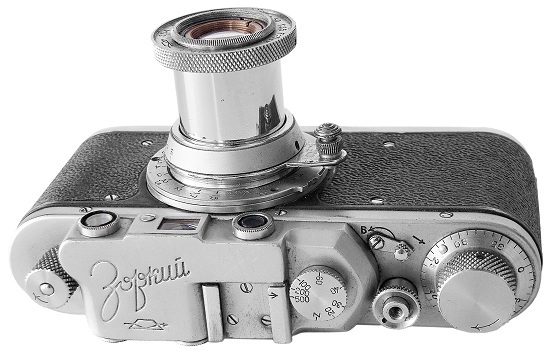 One of the widest known brand in soviet photo industry. The second attempt (and quite successful indeed) to produce mass-market Leica copies. 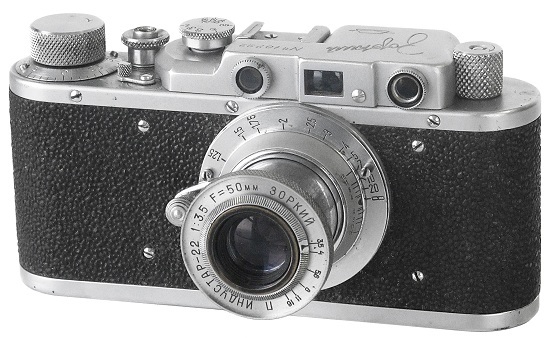 During WW2, The Soviet camera maker FED was evacuated to escape advancing German troops. After the war FED had troubles getting its copy of the pre-war German Leica 35mm camera back into production. 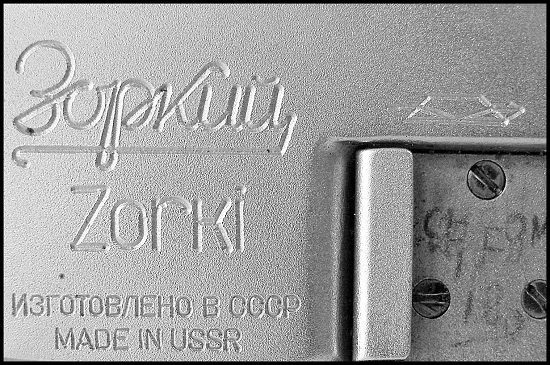 Because KMZ's plant had escaped destruction, that company started making the FED camera under a joint FED-Zorki logo. 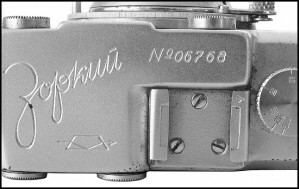 When FED got back in operation, KMZ continued to produce the cameras under the Zorki trademark (intended for export either) and made some design changes. Shutter: 1/20s, 1/30s, 1/40s, 1/60s, 1/100s, 1/200s, 1/500s (+1/1000s on early samples) + Z. Quantity: 835.502 units (all types). Thanks to †Giedrius Laukaitis for camera #317507 donation. Thanks to Algimantas Rudokas for camera #41553 donation. 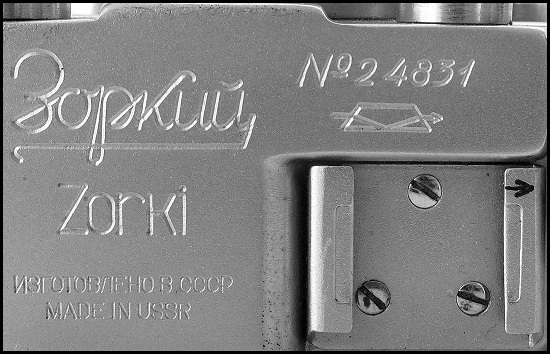 Disclaimer: All the ZORKI Serial Number Ranges are approximate! 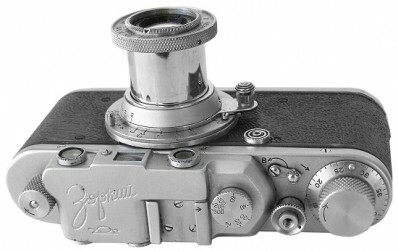 The first 39mm Leica-thread bodies assembled in MOscow are FED cameras. They are built in late '47/early '48 in collaboration with engineers sent from the FED works. 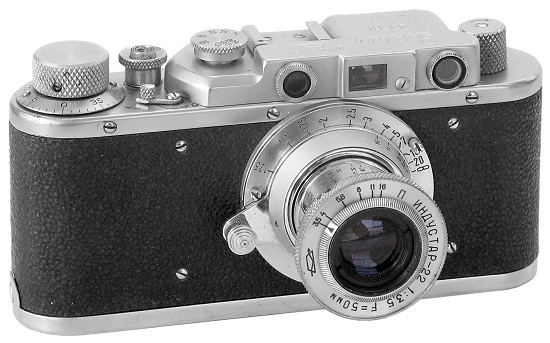 In those years, according to the Soviet photographic mentality, the home-built version of the Leica is called the FED; therefore when the FED name was engraved over the KMZ logo this was not intentionally done with the idea of usurping the name. The Gavrilov team rapidly develops the design. Starting in early 1948 the engraving is embellished with the name "ZORKI", the Russian word for "a piercing regard". 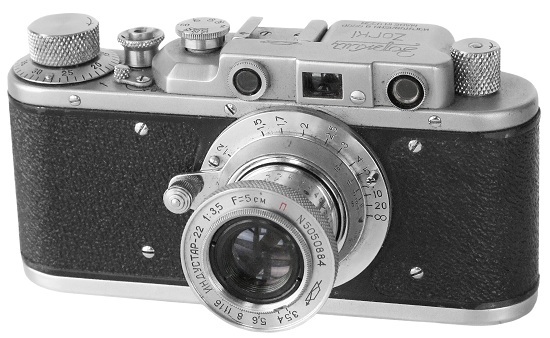 A new, great Leica copy was born. FED-KMZ (1948) No. 00070. Preseries of the FED-ZORKI. First FED's assembled in Krasnogorsk. The shutter goes to 1/1000s. 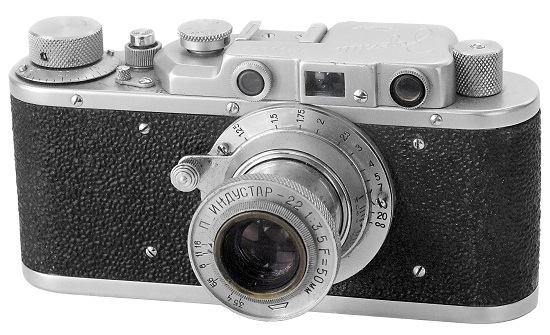 Exceptionally rare, this is a key piece for a collector of Leica copies or Russian cameras ... (source: J.L.Princelle "The Authentic Guide to Russian and Soviet Cameras", 2nd edition 2004). Quantity: appr. 100 units, but only very few are known to survive. Camera bellow from Ilya Stolyar (USA) collection. 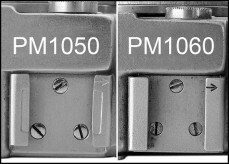 PM1005. This ultra rare camera is covered in "paper" looking leatherette, joined from 5 separate patterns. Very thin and bad chrome. 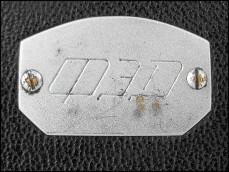 Metal plaque with markings "FED" screwed on the camera's back (see picture below). 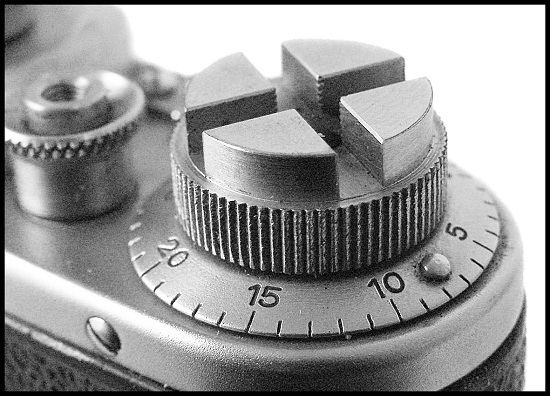 Very small-sized shutter speeds engraved on the speeds knob. An earliest so far known camera has s/n #00063 (A.Berry coll.). PM1005 - Fed (KMZ) #00070. Further evolution of the particular camera. 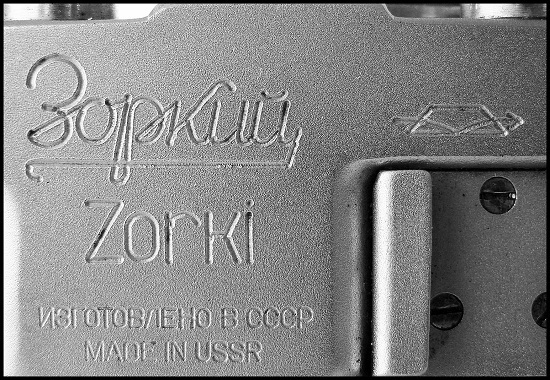 Under name "FED-Zorki" engraved on the top plate already. A limited quantity released in 1948-1949 only (the year of manufacture is also shown on the top plate, either 1948 or 1949). 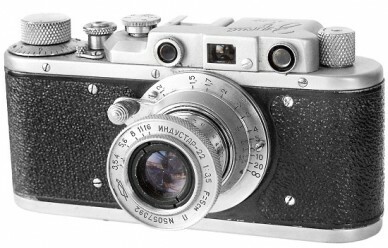 Almost half of "FED-Zorki" (1948) cameras come with 1/1000s shutter speed, which was replaced by regular 1/500s shutter speed in 1948. Quantity: less than 5.700 units. 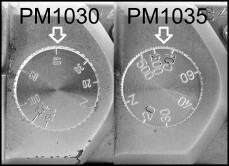 PM1010. 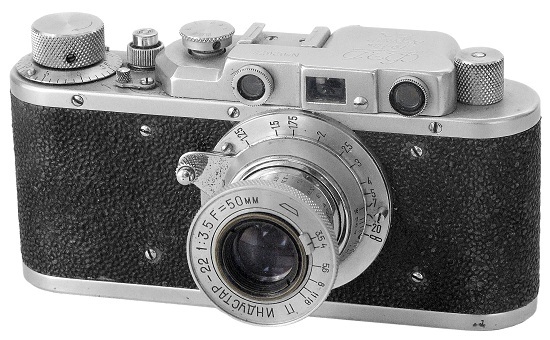 Seems to be an earliest version of "FED-Zorki" camera. Body still covered in "Zeiss Contax" origin black leather, joined from 5 separate patterns. The chrome is better quality in comparison with PM1005. 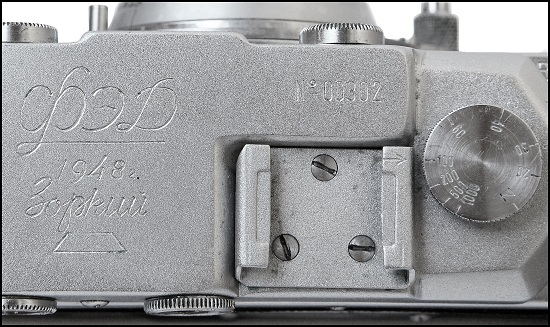 New design of metal plaque with markings "FED" screwed on the camera's back (see picture below). 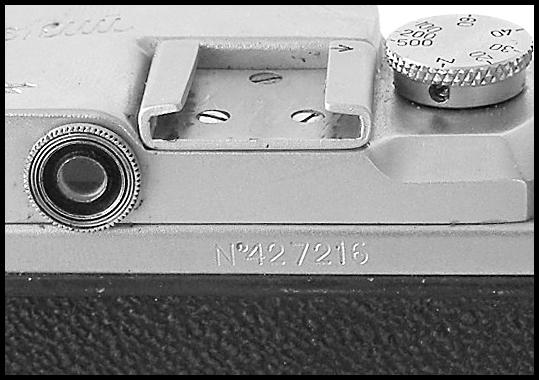 An earliest so far known camera has s/n #00121 (on manual guide). PM1010 - FED-Zorki #00302 from Alexey Nikitin (Russia) coll. PM1015. Further evolution of the particular camera with black vulcanite, instead of "Contax" leather already. Therefore no more metal plaque to cover the "Zeiss Ikon" logotype on the camera's back. Still very small-sized shutter speeds up to 1/1000s engraved on the speeds knob (see picture below). An earliest so far known camera has s/n #00672 (private coll.). Camera opposite from Ilya Stolyar (USA) coll. PM1020. Camera identical to PM1015, but with regular 1/500s shutter speed already. 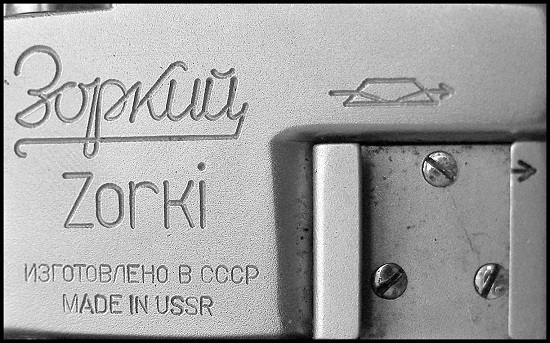 Completed with Industar-22 "Moskva" or Industar-22 KMZ "tomb" logo 3.5/50mm lens. Appr. 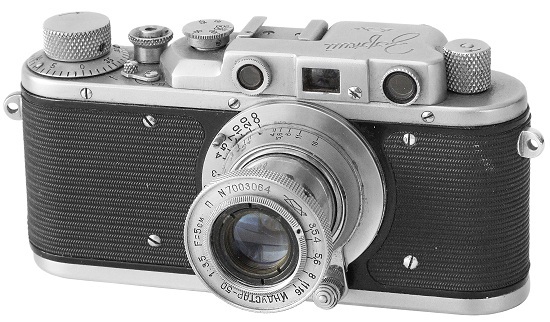 4700 copies of PM1010-1020 "FED-Zorki" (1948) cameras released by KMZ in 1948, but be aware - a lot of recent fakes are known to exist! An earliest so far known camera has s/n #01095 (private coll.). Camera opposite from Ilya Stolyar (USA) coll. PM1025. Very uncommon version of the "FED-Zorki" camera. Identical to PM1020, but with Year "1949" engravings on the top plate. Less than 1000 copies released by KMZ in 1949. An earliest so far known camera has s/n #04811 (Aukro 2015). 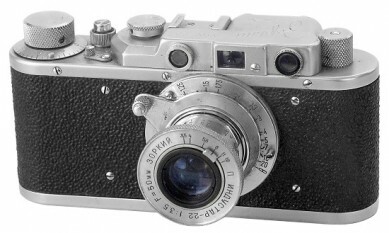 Camera opposite from Ilya Stolyar (USA) collection. 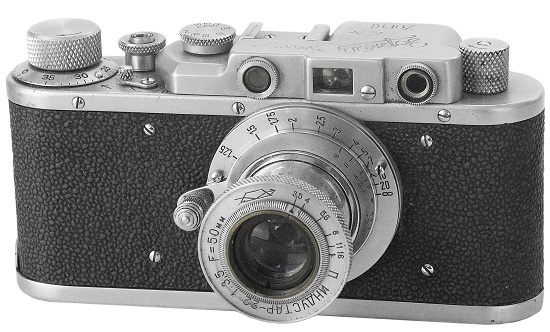 Camera identical to Fed-Zorki, but with single "ZORKI" name already, engraved on the top plate. Shutter release is not threaded yet to accept a cable release. Very few Zorki type-A cameras can be found with 1/1000s added (unconfirmed). Quantity: less than 3.000 units. 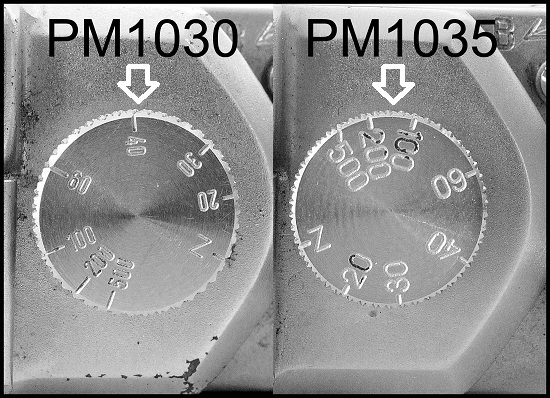 PM1030. Identical to the Fed-Zorki. The collar around the shutter release can no longer be removed (unconfirmed). 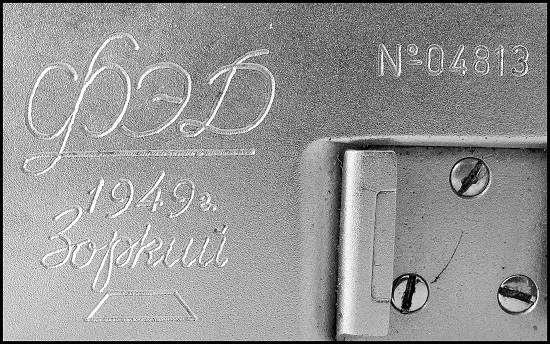 On the top plate is a new Zorki logo in cursive Cyrillic characters above the new KMZ logo („tomb“ is now crossed by an arrow). Delivered with early type of the Industar-22 "Zorki" lens (see diaphragm control). Rare to find nowadays. An earliest so far known camera has serial number #05784 (Bill Parkinson coll.). Camera opposite from E.Tutkus coll. PM1035. 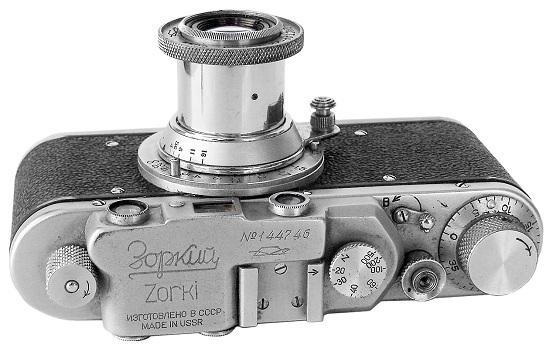 Very uncommon transitional version of Zorki camera. 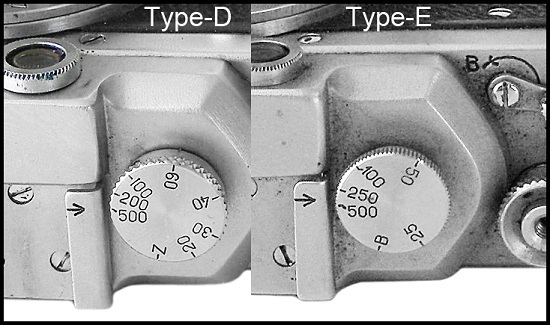 Top plate is identical to early versions, but shutter speeds knob is already newer regular type (see picture above). 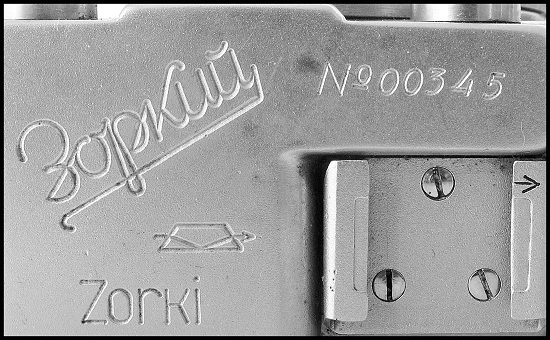 The particular Zorki has shutter, completely made in KMZ already (see picture below). Camera opposite from E.Mehdiyev (Russia) coll. The collar around the shutter release is threaded to accept a cable release already. Still three screws in the back of the top plate (starting from type-C all cameras come with two screws only). 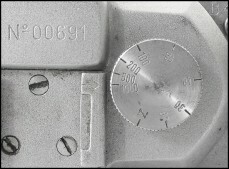 Larger figures engraved on shutter speed knob. Serial number range estimated to begin with #8000. An earliest type-B cameras still have engravings on an accessory shoe. 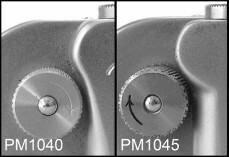 PM1040. 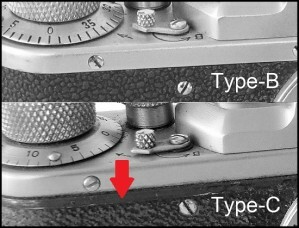 The collar around the shutter release now is threaded to accept a cable release (see picture below). Coarser gripping surface on film rewind knob. Delivered with late type of the Industar-22 "Zorki" lens (see diaphragm control on picture opposite). An earliest so far known camera has s/n #08.068 (private coll.). Camera opposite from Ilya Stolyar (USA) coll. PM1045. 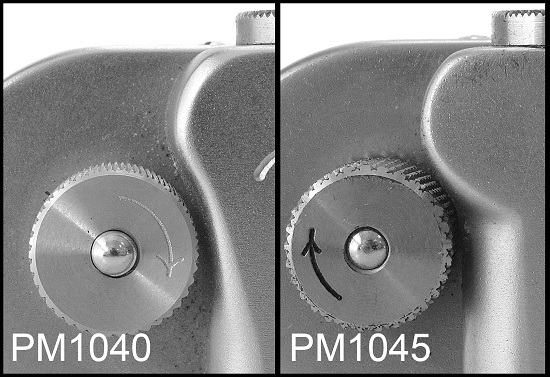 Camera identical to PM1040, but with coarser gripping surface on both control knobs. New mouldings of the top plate (see picture below). Camera opposite from Ilya Stolyar (USA) coll. PM1050. Camera identical to PM1045, but with bilingual export markings on the top plate (see picture below). 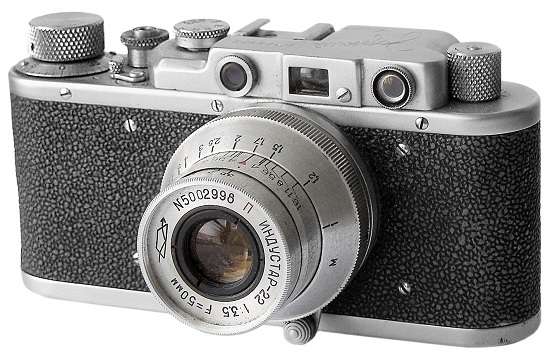 Cameras from the 1st export batch are rare to find nowadays. 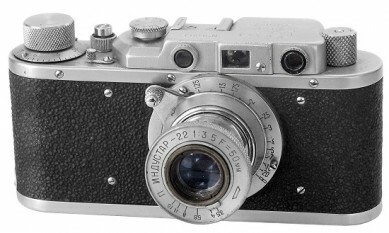 An earliest so far known camera has #24005 (D.Bessonov coll.). Camera opposite from Ilya Stolyar (USA) coll. PM1055. An ultra rare example of alternative export camera. 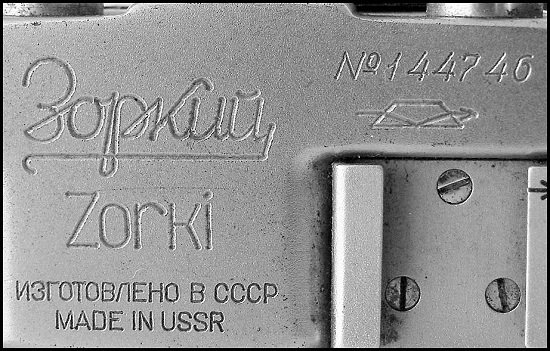 Supposedly one of only few attempts to change the design for export version of Zorki camera. 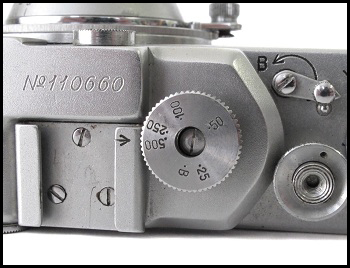 Visually featuring all the details of regular Zorki-1 (B) camera in serial number range #35.000-#40.000. Camera opposite from Ilya Stolyar (USA) coll. PM1055 - Zorki (Specimen) #00345. PM1060. Transitive version without engravings on an accessory shoe already (see picture below). An earliest so far known camera has s/n #70025 (private coll.). 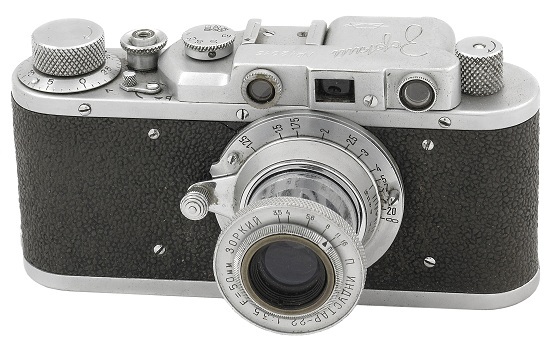 Camera opposite from E.Tutkus coll. PM1065. Identical to PM1060, but with bilingual export markings. An earliest so far known camera has s/n #69204 (M.Muda coll.). PM1070. Experimental version of the particular camera. 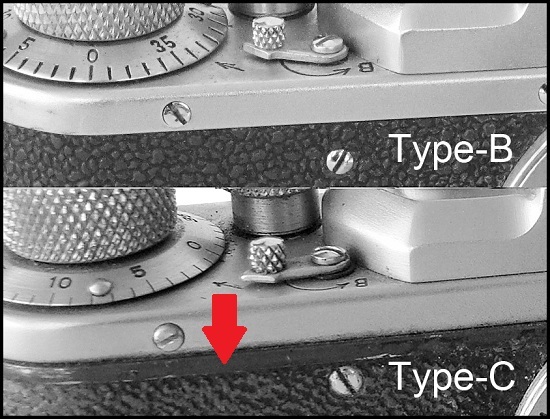 Probably the 1st KMZ's attempt to improve the shutter of Zorki-1 camera (c.1951). This improvement allows to change the shutter speeds in both advanced or released shutter conditions. 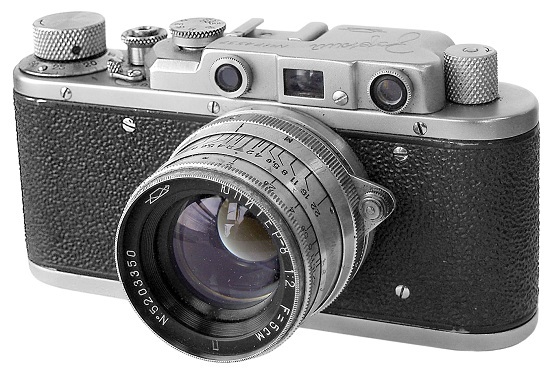 Despite the fact, that experiment was successful enough, this system was implemented in Zorki-2 camera only (c. 1954). Camera opposite from Ilya Stolyar (USA) coll. Identical to the Zorki type-B, but henceforth using injection molded parts for the shutter assembly casing and the camera chassis. Chrome camera parts outlined by a decorative rim. 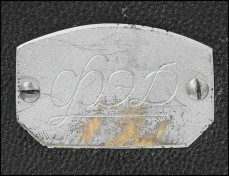 Index mark on the release collar. The accessory shoe loses its engravings . Very few type-C prototypes are known with strap lugs and slow speeds disk on the frontplate. These cameras are fitted with fast Jupiter-8 2/50 lenses. Serial Numbers Range: #115.000-#470.000. .
PM1075. Quite common camera to find. Two screws on the rear plate already. 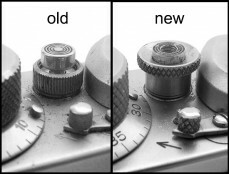 The change to two screws appears to coincide with the introduction of a stronger alloy body shell that made the middle screw unneccessary. 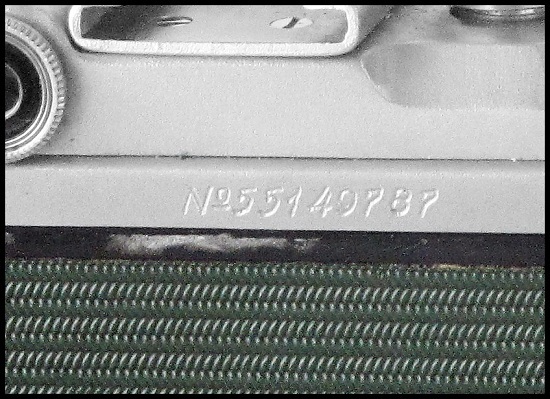 Serial number engraved on the top plate yet. An earliest so far known camera has s/n #106.182 (eBay 2009). 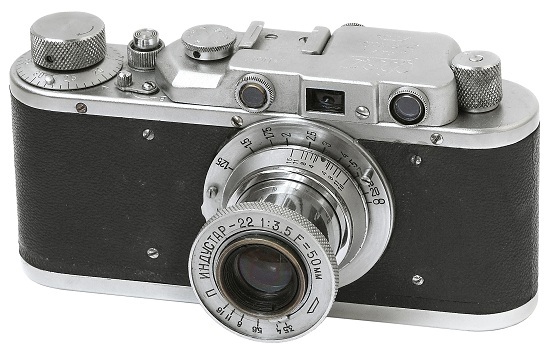 Since 1952 some cameras were originally fitted with fast Jupiter-8 2/50mm lens (see picture opposite). These cameras have special leather case. 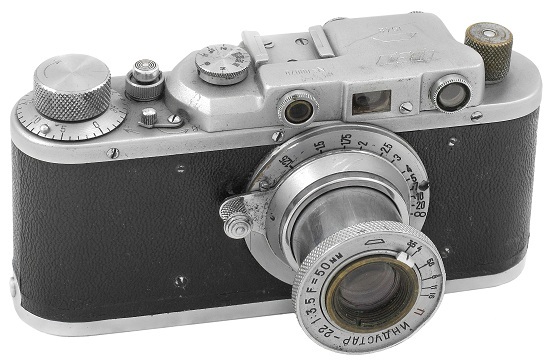 An earliest so far known camera has #174537 (SovietCams), the latest one - #179539 (eBay 2008). PM1080. Camera identical to PM1075, but with bilingual export markings on the top plate (see picture below). PM1085. 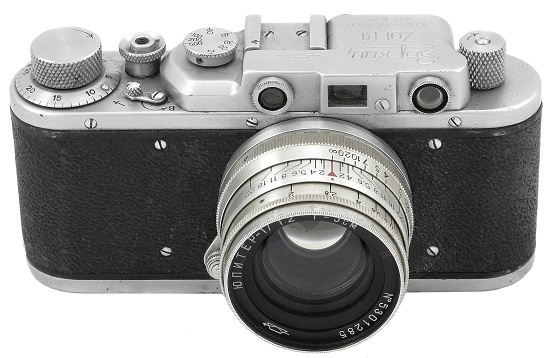 Prototype of Zorki-3 camera with strap lugs and slow speeds disk on the frontplate. These cameras are fitted with fast Jupiter-8 2/50 lenses. Very few cameras are known to exist. An earliest so far known camera has s/n #123892 (Claudio Asquini coll.). Camera opposite from Claudio Asquini (Italy) collection. 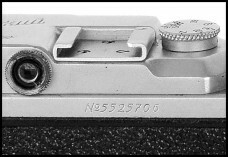 PM1085 - Zorki prototype camera. PM1090. 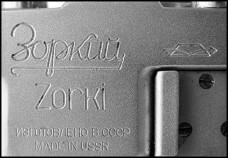 Very interesting sample of Zorki camera. Comes with external bayonet for unindentified camera-related equipment. 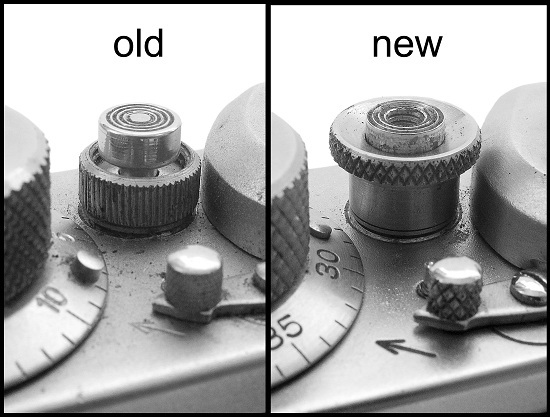 Different design of shutter advance knob, intended for automatic film winding (see picture below). Camera opposite from private collection in China. 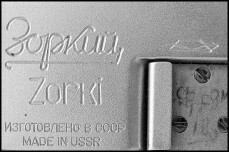 PM1090 - Zorki technical #319948. PM1095. 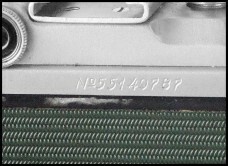 The serial number moved to the rear plate already. Serial number is embossed, instead of usual engraved one. Name markings on the top plate is stamped, not engraved already. An earliest so far known camera has #413955 (J.Showalter coll.). PM1100. Camera identical to PM1095, but with bilingual export markings. The particular camera #443050 comes with an ultra rare Jupiter-17 2/50mm lens, which was never produced in series(!) 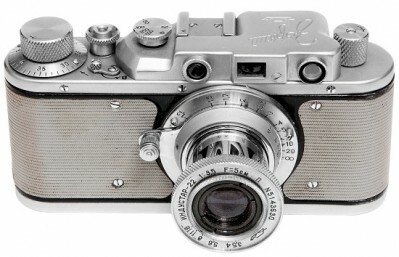 This camera coming in special leather case with KMZ Logotype and markings "Made in USSR" on it. PM1100 - Zorki #443050 with Jupiter-17 2/50 lens. 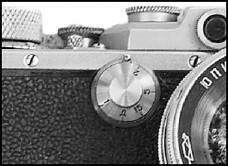 Identical to the Zorki (type-C), but the rim is extended around the lens mount. This decorative element is part of the casting and cannot be removed from the body. Serial Numbers Range: #470.000-#55 45.000. 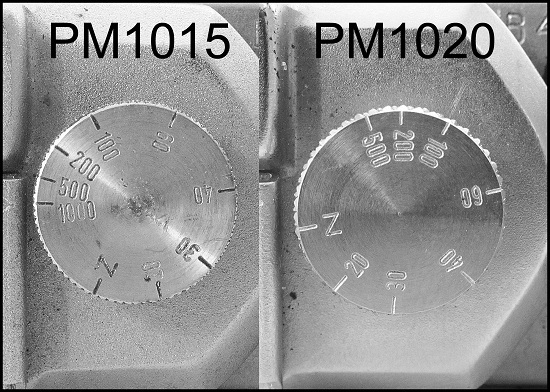 PM1105. Identical to type-C cameras, but with the rim extended around the lensmount. Single name markings stamped on the top plate. 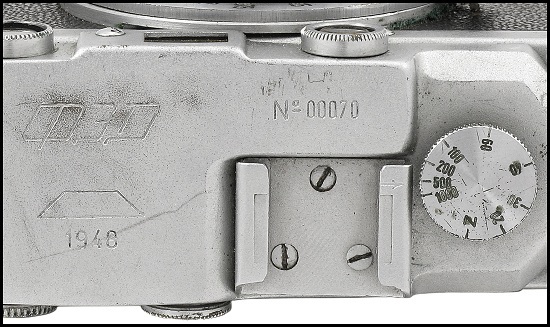 An earliest so far known camera has serial number #470.751 (Kalle Salonen coll.). 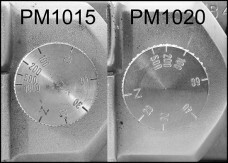 PM1110. 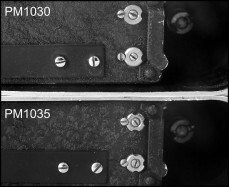 Camera identical to PM1105, but with bilingual export markings on the top plate. Very uncommon to find. An earliest so far known camera has s/n #539436 (I.Stolyar coll.). PM1115. 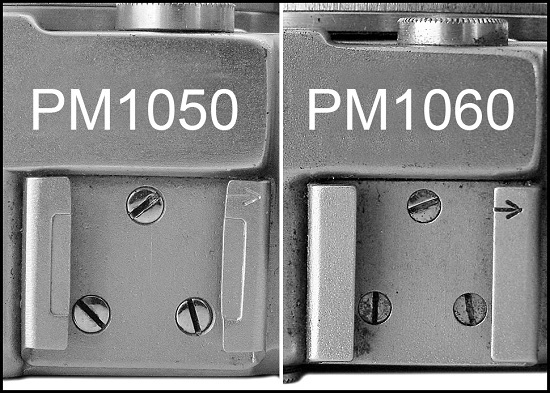 Camera identical to PM1105, but with new numbering system already. 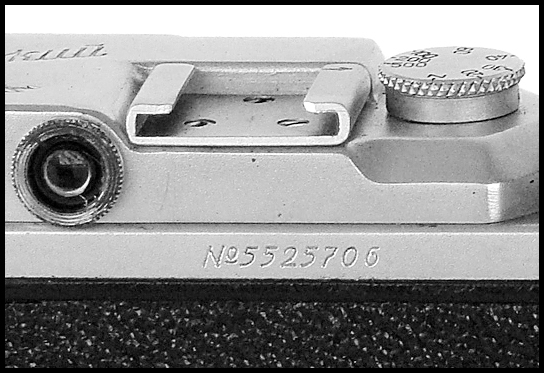 Since 1955 Zorki cameras have date prefix on theirs serial numbers. An earliest so far known camera has #55 05637 (Molotok 2008). PM1120. Very uncommon to find camera. 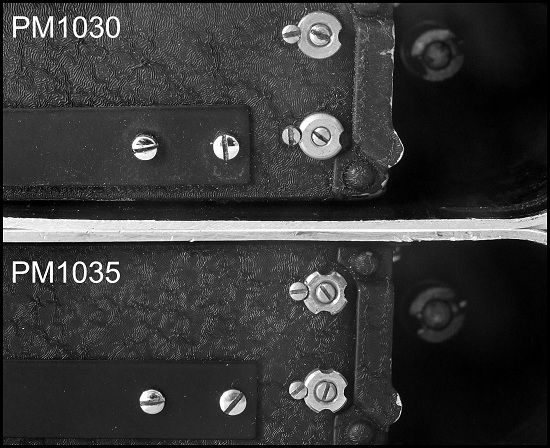 Identical to PM1110, but with date prefix in serial number already. Camera opposite from Ilya Stolyar (USA) coll. 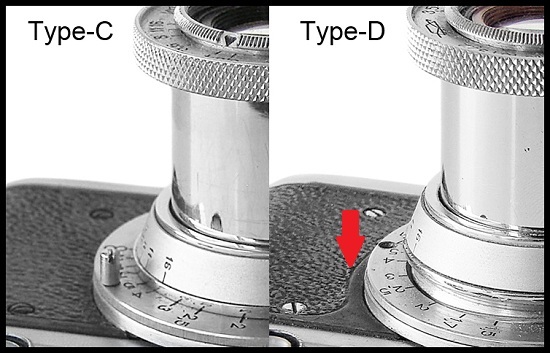 Identical to the Zorki-1 (D), but with the new international shutter speed's sequence: 1/25s, 1/50s, 1/100s, 1/250s, 1/500s + B. 6 shutter speeds instead of 8 speeds on previous versions. 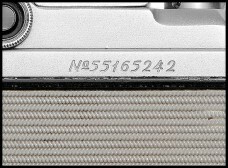 Serial Numbers Range: #55 45.000-#56 35.000. PM1125. Identical to PM1115, but with the new international shutter speed sequence B; 1/25s – 1/500s. An earliest so far known camera has s/n #55 11938 (eBay 2008). PM1130. Identical to PM1125, but with bilingual export markings. Investigated camera has s/n #5571157 (I.Stolyar coll.). 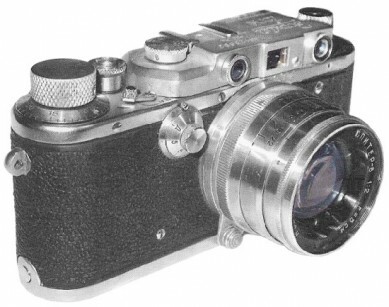 An earliest known camera has s/n #5508730 (S.Kochergin coll.). PM1135. 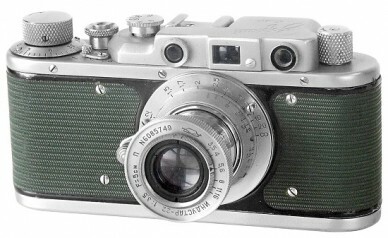 Camera identical to PM1125, but covered in green synthetic leather, instead of black vulcanite. 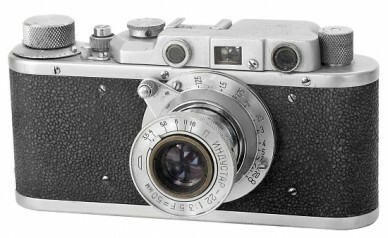 According to Princelle and Suglob sources, these very few cameras were intended as a gift for important guests. Possible variations with strup lugs on body or with bilingual export markings. Very rare to find nowadays. Camera opposite from Ilya Stolyar (USA) coll. PM1140. identical to PM1135, but covered in white synthetic leather. These very few cameras were intended as a gift for important guests. Possible variations with strup lugs on body or with bilingual export markings. Very rare to find nowadays. PM1145. Very rare donative version again. Covered in black synthetic leather with authentic strap lugs on body. Possible variations without strup lugs on body or with bilingual export markings. Very rare to find nowadays. Camera opposite from Ilya Stolyar (USA) coll. PM1150. 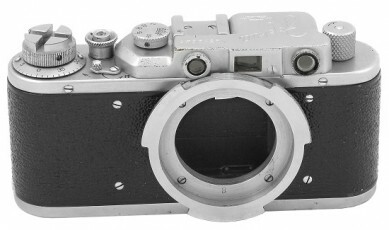 Camera identical to PM1140, but covered in blue synthetic leather. No strap lugs on body. Possible variations with strup lugs on body or with bilingual export markings. Very rare to find nowadays.